Dave Robicheaux is back, in a gorgeously written, visceral thriller by James Lee Burke, “the heavy weight champ, a great American novelist whose work, taken individually or as a whole, is unsurpassed” (Michael Connelly). Creole Belle begins where the last book in the Dave Robicheaux series, The Glass Rainbow, ended. Dave is in a recovery unit in New Orleans, where a Creole girl named Tee Jolie Melton visits him and leaves him an iPod with the country blues song “Creole Belle” on it. Then she disappears. Dave becomes obsessed with the song and the memory of Tee Jolie and goes in search of her sister, who later turns up inside a block of ice floating in the Gulf. Meanwhile, there has been an oil well blowout on the Gulf, threatening the cherished environs of the bayous. 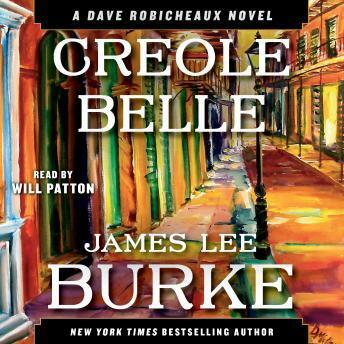 Creole Belle is James Lee Burke at his very best, with beloved series hero Dave Robicheaux leading the charge against the destruction of both the land and the people he has sworn to protect. Top rating from me! This is the greatest story! I thoroughly enjoyed seeing how these daughters are so much like their dads, and it made me laugh as well - Much needed levity with such serious situations! Mr. Patton is the perfect narrator for these works - extremely talented! Loved it!